A Collection Of Photos From Paul Weller’s Performance At The Enmore! – Paul Weller News! 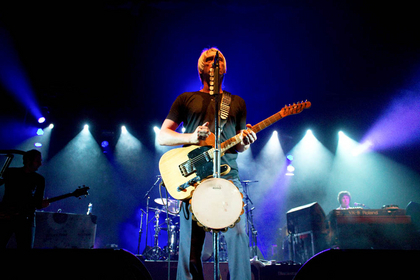 A Collection Of Photos From Paul Weller’s Performance At The Enmore! 1 Comment on A Collection Of Photos From Paul Weller’s Performance At The Enmore! A really nice collection of photos from Paul’s performance at the Enmore Theater in Sydney can be found at the following LINK. Paul Weller could be doing the nostalgia circuit right now, along with the Eagles, the Rolling Stones and countless others, churning out the same twelve 30-year-old songs for audiences lusting after their distant youth. The kind of stasis that comes with that sort of gig, though, is completely at odds with the restless and creative man that broke up the Jam at their peak. Burning with the kind of energy that’s sorely lacking in many contemporary songwriters, Weller still commits every ounce of himself to every chord. His latest album, the incendiary Wake Up The Nation, was a furious testament to this, and that record’s thunderous rock shaped tonight’s set – each song, regardless of its earlier form, was delivered with room-levelling force. Even Shout to the Top, the original glossy and fey even for a Style Council track, was thick and bombastic, the saccharine strings replaced by tough guitar stabs. From the slashing intro of From the Floorboards Up, Weller led the assault with a cool charisma that suggested the NME might have been remiss in placing him as high as sixth on their 2010 Cool List. To steal a line from a make-up campaign, Weller doesn’t so much deny his age as defy it, throwing himself bodily into each song with the energy of a much younger man. The top half of the set flew by without pause or hesitation, slamming from a muscular version of 22 Dreams, through Andromeda and Into Tomorrow to the steely 7 & 3 Is The Striker’s Name. After the aforementioned Style Council track, Weller introduced the next song as one “written some time in the 1800s” before striking up the immortal opening of That’s Entertainment, and at this point, your correspondent was concerned plaster would start falling from the ceiling, so mighty was the cry from the audience. Working through a crowded set list (the show would ultimately go for two hours), Weller smashed out Jam, Style Council and solo tracks with unflagging enthusiasm. During the brighter numbers, like the insistent Pretty Green, Weller shuffled and danced, and though he might not challenge Justin Timberlake for grace, his joy was obvious to all. After waving goodbye at the close of Echoes Round the Sun, Weller and Co. made us wait for the first encore, but the slightly prolonged delay was more than worth it for the live-wire Fast Cars/Slow Traffic. A few more tracks, and Weller ducked off again, but the audience wasn’t ready to let the night end. Thankfully, neither was Paul, and the band returned for another three song encore. If he’d ended it there, no one would’ve been disappointed. Weller, clearly keen to repay the avid audience for their enthusiasm, returned one last time and, without a word, bassist Andy Lewis struck up the iconic bass intro for A Town Called Malice. Well, if the Enmore’s structural integrity was in doubt earlier, that was nothing compared to the wall-shaking roar that erupted. Those in the balcony leapt to their feet, dancing and shouting along to this, one of the best songs of the 20th century. If there’s a textbook on how to run a gig, this forms the chapter entitled ‘How To End A Show’. Paul Weller, you’re a legend for a very good reason. Previous Entry Paul Weller At The Metro In Sydney! (10/23/10) NEW SONG PLAYED – "Paper Chase"
Next Entry Paul Weller At The Enmore & Metro – A Fan’s Review!